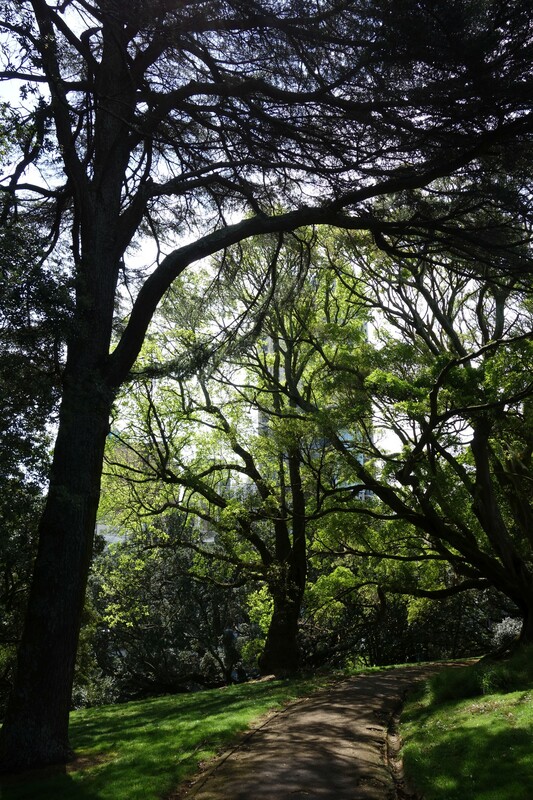 One of my favourite parks in Auckland, Albert Park is an oasis of Victorian style greenery in the CBD, surrounded by heritage buildings belonging to the University of Auckland, and the wonderful Auckland Art Gallery. Dating from the 1880s, it is one of the oldest parks in Auckland (along with the Domain and Western Park in Ponsonby). I captured it as the sun came out after a wet Spring morning, resplendent in lush green. I particularly like the gnarly ancient trees with their epic branches, blocking out the sunlight. It has plenty of reminders of Victorian times, including most obviously a statue of Queen Victoria, a large fountain, a bandstand from 1901, a flag pole and several cannons. At the top of Victoria Street is a huge sculpture by Chris Booth aptly named Gateway, a fitting entrance for the park, which is an oasis of greenery compared with Victoria Street.